A proper dance floor is a major investment, and the most important one a dance studio can make, so wouldn't it be great to be able to take it with you if you move. Finally, there is a totally portable sprung subfloor that you can take with you from studio to studio, classroom to classroom, even to the theater for a dance concert. In 2002, Wooden Kiwi Productions partnered with Rosco Laboratories to develop, patent, and market a modularized version of our well respected kiwiFLOOR Panel Systems, and it is now available worldwide as the Rosco SubFloor. The SubFloor uses a unique and patented backbone system with exclusive Wavelock Technology that locks one panel to the next without any hardware. Unlike other systems that do not specifically join panels, and rather creates a series of hinges between panels, the Subfloor system is securely locked and moves as one for optimal diaphragm stability. 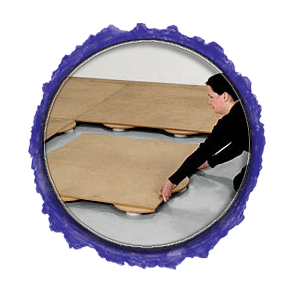 Constructed of 2 layers of furniture grade Medium Density Fiberboard and using the same closed cell foam pads as our kiwiFLOOR Systems, the SubFloor offers truly superior dynamic response and feel. It is flexible enough to absorb the energy from a dancer's impact but provides the right amount of resistance for dance movements ranging from ballet to tap, including folk, modern, flamenco and Irish dancing. See a LIST of Rosco SubFloor clients.